Are your customers continually asking for your HACCP certificate or Food Safety management system? Have you lost a customer because of your current food safety plan? Would you like to have confidence that all your food safety risks are under control? Does your retail operation need a Council registered Food Safety/ HACCP audit? ICS Food Safety consultants can help…. Our qualified Food Safety management system consultants specialise in helping small to medium-sized businesses when they need to develop and maintain a lean and simple, cost-effective Food Safety Management System. And it doesn’t have to cost you a fortune – you can choose if you want us to help out with advice or, alternatively, do it all for you!- Whatever suits your needs and budget. Our competent Food Safety auditors can also audit your existing Food Safety management system for compliance against a range of standards (such as BRC Global, SQF or ISO 22000). An ICS qualified Food Safety management system consultant will also train your team and empower you to understand and make changes to your own system. To find out more about how an ICS Food Safety auditor can help YOUR business- call us NOW on 1300 132 745 for a FREE no-obligation 1 hour appraisal or register your interest HERE. What are the benefits of implementing a Food Safety Management System and Food Safety Certification? When we manufacture food, we want to be sure that food is safe to eat. The best way of achieving this is by building a HACCP system. Confidence in safe product. The main benefit of HACCP is confidence. Confidence for ourselves that the food we make is safe. Cost Savings. One of the foundations of HACCP is setting up early detection of problems in the process line. This means that product that has a problem is detected more quickly and this can save a lot of money, as the problem can be contained before it spreads, gets sent out or mixes in with other clean product. Legal Protection. It has been widely accepted that HACCP based systems present the food industry with the most effective management tool to enable the production and supply of safe food. As such, the adoption of this approach can offer a legal defence in the event of an outbreak of food borne diseases. Training. HACCP helps with training new staff because it maps exactly what our processes are and where the important points are and what to do when something unusual happens. Entry to market. The larger the buyer, the more likely they are to insist that we have a HACCP based food safety system. Alignment with other management systems. 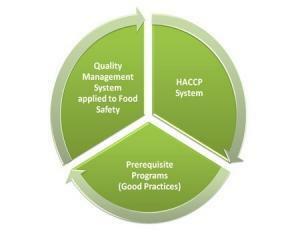 HACCP forms the basis for all of the other main Food Safety management systems. That means that once HACCP is in place, it is easy to upgrade to meet specific buyer demands. Certification to one of the Food Safety standards provides your customers with the evidence that your system truly complies with the Standard and that it is being checked on a regular basis and audited by an independent authority. The certification audit is an opportunity to make ongoing improvements to your system. Many companies also find that Certification is a valuable marketing tool. ICS follow a series of clearly defined steps in developing or preparing your HACCP/ Food Safety Management system for certification. In consultation with your staff, your Food Safety management system consultant will evaluate every step of your process and identify the strengths and weaknesses and where the risks are. They will determine exactly what is required for your organisation to achieve compliance with regulations and to create a system which is suitable for your organisation and as user-friendly as possible. The next step is to establish what the potential hazards are at various points in the production process (Critical Control Points or CCP’s) and to create a plan that will prevent them and/ or fix them if they happen (The HACCP plan). All relevant staff are then thoroughly trained in the reasons for/ and the requirements of the food safety management system according to your organisations and individual needs. Your consultant will then set up a simple system of records which shows how well you have been identifying, monitoring and eliminating hazards. This would include records of risks and how they are being controlled and what prevention programs are in place. Our qualified technologists base all of these measures on sound scientific knowledge. We check in on you on a regular basis to ensure that the system is effective and to make any changes or improvements you require. How do HACCP, ISO 22000, BRC and SQF relate to Food Safety Standards? HACCP is the risk assessment tool applied for food safety assurance. It is internationally recognised and used in every compliance standard. It is not a standard in itself although your business can be certified as having a “HACCP system”. ISO 22000, BRC and SQF are internationally accepted food safety standards by GFSI that include the HACCP risk assessment tool with an in depth focus on Quality Management and Good Manufacturing Practices. Hazard Analysis Critical Control Points (HACCP) is an internationally recognised risk management tool which is designed to prevent physical, chemical and biological hazards in food and beverages BEFORE the finished product stage. A HACCP system helps you to proactively address food safety risks through identifying and establishing control measures at critical control points (CCP’s) during production. HACCP is also a key element of many compliance standards and is frequently a requirement in international food trade legislation. HACCP is relevant and widely used across all sectors of food and related industry including growers, manufacture, retail, packaging, distribution etc. If you already have ISO 9001, you are almost there with implementing ISO 22000. Being an ISO product, ISO 22000 uses some of the same principles and applications as ISO 9001. Therefore, ISO 22000 consists of Quality Management and HACCP. ISO 22000 can be used by businesses with production, processing, transport or distribution of food products. There is a strong focus on quality assurance therefore requires management commitment to the program. FSSC 22000 is an internationally accepted standard and approved by GFSI. The British Retail Consortium is a UK trade organisation that represents the interests of retailers. Also, recognised by the Global Food Standard Initiate, BRC is an internationally accepted standard for safety and quality assurance and can be used in any country and for any type of customer. BRC was initially developed to establish a standard for due diligence and supplier approval. It includes safety practices with a strong focus on a Quality Management System (QMS), HACCP (by Codex Alimentarius) and Good Manufacturing Practices. BRC follows the core principles of ISO 9001 as part of its quality management system. Both Coles Supermarket and Costco Wholesaleaccept the BRC Global Standards Food Safety. Minimum pass rate is Grade B. Check out brcglobalstandards.comfor further information. SQF is your assurance towards Safe and Quality Food. Recognised by the Global Food Standard Initiate, SQF is an internationally accepted standard for food safety and food quality assurance. SQF entails management commitment to not only conduct safety practices of your product or services but also to ensure quality and regulatory requirements are met. SQF 1000 caters for primary production and SQF 2000 is applicable for food manufacturing, storage, distribution and agent/broker management certification. Commitment to Food Safety. SQF can only work if the owners of the business or the core managers are committed to the program. Business continuity (crisis management), customer complaints management, and management reviews are included as part of your commitment to food safety. Product Development. In order to ensure compliance against regulatory, safety and quality, research and development of new products adhere to these procedures. HACCP and Good Manufacturing Practices. Includes the HACCP risk assessment tool and all support programs required to control your Critical Control Points. Both Allergen Control & Quality are included at Level 3. Verification & Validation. Verification ensures the SQF management system is functioning effectively and validation ensures all elements of the system achieves its intended purpose. SQF certification is your assurance towards customer trust and loyalty. Head over to the SQF website www.sqfi.com for further information. 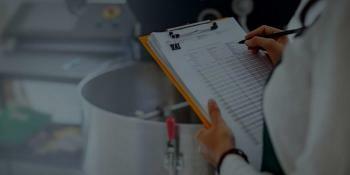 Is there a difference between ISO 22000, BRC and SQF? It is a matter of personal opinion. All three are accepted by GFSI because they all pass the benchmarked food safety criteria. To choose an international standard, it is best to determine what YOUR customer requirements are. For instance, if you supply product to Coles Supermarkets, choose either BRC or SQF. Both BRC and SQF have a strong focus on quality management and are extensive on Good Manufacturing Practices and other support programs. How do I choose a food safety standard? Choice is an owner / top management decision. Management will need to review each standard and decide which one best suits their company’s culture, existing quality assurance and /or food safety system and customer requirements. Whichever standard you decide upon, bear in mind management will be required to commit resources, time, staff and investment. A Food Safety Management System is a path to beneficial changes that will be continual and will require ongoing maintenance and compliance. – What are your customer requirements? – Are you already ISO certified? Below are suggestions of which international food safety standard is best suited for which type of business you have. BRC Global may be best suited for food manufacturers. SQF food safety may be best suited for food manufacturing, storage, distribution and agent/broker management certification. SQF also has detailed Canning Operations of food product.